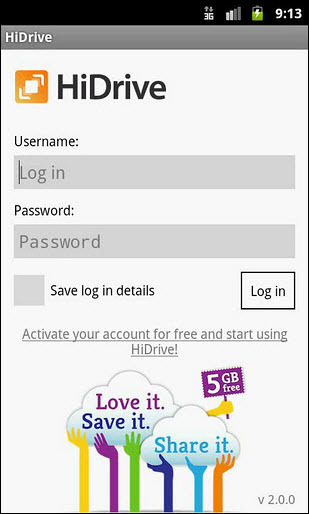 HiDrive Free offers 5 GB free online storage space. This services is facilited by Strato, a German company which has been in the webhosting business for many years. They sell webhosting services in Germany, the United Kingdom, The Netherlands, France, Italy and Spain. They started a while ago with their HiDrive services (online storage) and from 1 september 2011 they offer a free 5 GB version of HiDrive. This is an international services and you can choose between four languages: English, German, Spanish and Portuguese. How does it work? Log in and you see three tabs (Overview, File Manager and Settings). In the first tab (Overview) click on Upload file. The second tab (File Manager) opens and a window (Upload new files) appears in the middle of the screen. In the dropdown menu you can choose for uploading 5, 15 or 20 files. You need to select the files one by one, which can be a little bit time consuming. Click on the button Start Upload. The files will be transferred to your HiDrive Free account. In the section File Manager you see on the leftside of HiDrive two directories: Public and Users. For the users of HiDrive Free this can be a little bit confusing. In both directories it is possible to create extra folders where you can store files. What is the difference between the Public and Users directory? In case you have the paid version of HiDrive you can create extra users in the Users directory and these extra users can share their files in the Public directory. Through the webinterface it is not possible to upload folders containing files. But do this little trick and you see that you can upload folders to your HiDrive Free account. Select the folder on your local computer and compress it to a zip-file. Upload this zip-file (which is actually the folder containing files) to your HiDrive Free account. In case you need any file in the compressed folder, it is necessary to download the compressed zip-file. Unzip it on your local computer and you can access the file you need in that specific folder. Offcourse it is possible to share files with other persons. How does it work? Go to the File Manager and select a file. Rightclick and select in the contextmenu Setup link. A new window Create Link appears. Fill in: Validity in days (maximum 30 days) and Maximum downloads (maximum 30 times). Click on Create. Again a new window opens: View Link. Now you can copy the downlinklink of this file. Unfortunately HiDrive Free doesn’t offer a built-in webbased mailclient, so in case you want to send this downloadlink by mail to your friends, you need to use your own mailclient. Strato HiDrive Free supports access by WebDav. If you are not a geek, you might haven’t heard of Webdav. What is webDav? WebDav stands for Web-based Distributed Authoring and Versioning. That sounds very geeky, but actually it is not so difficult as you might think. With WebDav the HiDrive Free account appears as an network drive on your local computer. You can access this network drive like any other disc, partition or folder on your computer. Now you experience that it is possible to navigate through the folders you created in your HiDrive Free account. It is possible to download from and upload to files (and even folders!) your HiDrive Free network drive. Most easy way: simply Copy (or Cut) and Paste the files in both directions (from and to the HiDrive Free network drive). Take a little delay in time into mind. That’s because your HiDrive Free network drive is actually based in a datacentre in Germany and is not a harddisc in your local pc! This trick might help you to improve the speed of access to your WebDav folder. With the free software 7-Zip it is possible to compress a folder with files. The result is a zip-file, which you can upload to Strato HiDrive. Strato HiDrive Free gives you the possibility to present the pictures in the File Manager as a slideshow. Open the File Manager, double click ont a photo and choose Start Slideshow in the menu at the top of the workspace. There is no support for users of HiDrive Free. In case you have any questions, go the forum. Or read the Quickstart manual (contains both English and German language) in pdf-format or read the FAQ or send a tweet to @HiDriveFree. There is also a Facebook page where you can meet other users of Strato HiDrive Free. HiDrive Free offers 5 GB free online storage without any annoying advertising. There is no bandwith limitation when you upload your files. HiDrive Free offers a webinterface where you can upload and download your files. You need to select the files one by one before uploading them and that is time consuming. Unfortunately it is not possible to upload folders to HiDrive Free, unless you use the WebDav protocol. Filesharing is possible, but HiDrive offers no built-in mailclient for sending the download link to your friends. 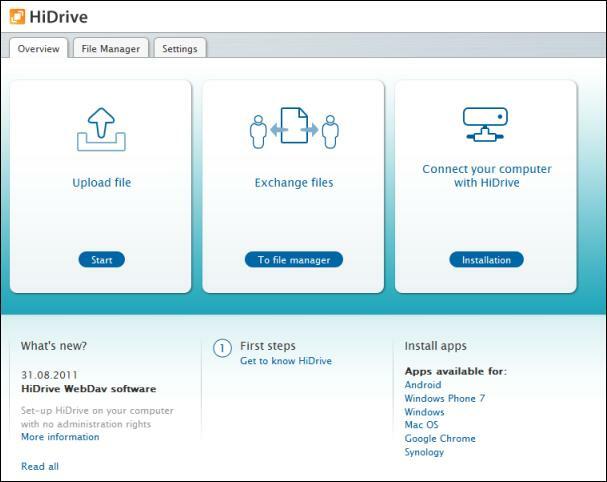 Users of Android, iPhone and WP7 can access HiDrive Free on their mobile devives. Rating 7,5 (out of 10).